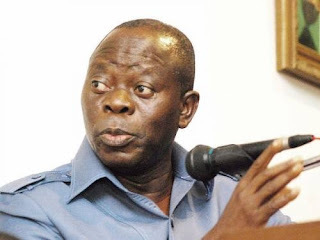 Those leaving the ruling All Progressives Congress (APC) are mercenaries who joined the party for personal gains, National Chairman Adams Oshiomhole said yesterday. He however added that those who have genuine complaints will be encouraged to remain and their fears allayed. Oshiomhole wrote off the coalition of parties supporting the Peoples Democratic Party (PDP) and expressed confidence that the APC will carry the day in Saturday’s Ekiti State governorship election. Oshiomhole spoke yesterday while inaugurating the non-Executive National Working Committee (NCW) members. He assured party chieftains that member of the PDP still holding sensitive positions as heads of agencies would soon be flushed out. He said the formation of the PDP-led Coalition of United Political Parties (CUPP) was a clear admittance by the main opposition and other political parties that they lack what it takes to unseat the government. “They are the conservative right-wing party. We cannot entrust to conservative forces an agenda for change. Government is not in the Villa. Villa is the head of government. Government is in the agencies – what they do, how they do it, the quality of service delivery and the style of that service delivery. “That is how the ordinary man interfaces with power and if these agencies are in the hands of those who do not believe in our change agenda, then we cannot expect miracles from them. “And for those who are aggrieved as to how certain things are done, those who question that they do not seem to see the difference because substantially, PDP is still managing these agencies, we have a duty to convince the federal executive that this government has no business with any PDP in sensitive federal agencies and using their old tactics in service delivery. That, I believe, is a task that all of us must pursue. Speaking on the R-APC, the former Edo State Governor said: “We will do everything possible to assuage those who have genuine grievances who simply want fairness and justice. I believe on your behalf, I can give them all the assurance that there will be justice, there will be fairness. “However, for the mercenaries, who mistakenly joined the party because of what they can gain personally, not for the good of the country, not for the good of the party; they came in purely for greener pastures and they have found that they have had to work hard to plant the grass, to wet it, nourish it for it to become green and they cannot wait, they want to run, not because we have wronged them but because we just cannot satisfy a mercenary, for those ones, we will not only open the door, we are ready to open even the windows. He added: “If you harness the energy of one million snails and transform it into one snail to run, it cannot catch up with an Antelope. So, when we were told 50 political parties had merged to confront us towards 2019, I was excited because first, that is a clear admission that as things stands today, neither had the one we defeated before, the PDP, nor the new one that they claim to have formed has what it takes. “They are now saying to Nigerians that ‘we want to capture power even though we are different, but for the purpose of capturing power, we will unite’, and I do not think Nigerians need any further explanation that enough of this opportunistic politicking”.